This year edhat has partnered with Spark Rescue, an all-volunteer non-profit animal rescue that re-homes pets at-risk for euthanasia in Santa Barbara. Members of Spark Rescue will be in attendance as well as a few special adoptable guests! A cash raffle will be held for a chance to win a variety of prizes from local businesses with a percentage of proceeds going towards Spark Rescue. Attendees will have the opportunity to gather with members of the Santa Barbara community, fellow edhat readers and commenters, local business owners, adoptable puppies, and more. The winners of the month-long competitive “March Edness” photo hunt challenge will also be announced and congratulated during the event. Edhat was founded in November 2003 by the late Peter Sklar as an online gathering for people to connect with neighbors and their community. It is one of the country’s first ever citizen journalism websites where readers submit news and content. Edhat has since bridged the gap between journalism and residents to include breaking news, community events, games, and contests. It is currently the only local website that allows commenting and discussions from its readers. 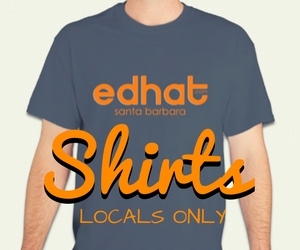 Edhat operates with no political affiliation, no corporate funding or any outside influence; it truly is a local grassroots organization and small business. For their 15th anniversary they want to celebrate their mission with those that have helped stay true to it. 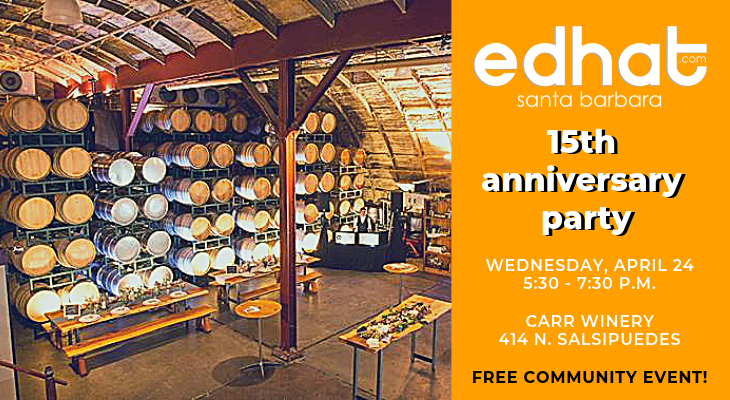 Celebrate edhat’s 15th birthday as they thank supporters for the continuous love, support, and contributions that keep them serving the community year after year. Email ed@edhat.com with any questions.